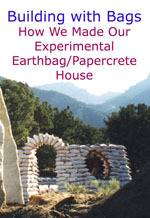 Building with Bags: How We Made Our Experimental Earthbag/Papercrete House 1 1/2 hr. DVD produced by Kelly Hart. We wanted to build an environmentally sensitive and aesthetically pleasing home at a moderate price. We chose to create earthbag domes covered with papercrete (recycled paper combined with cement and sand). This honest DVD documents details of the construction, insights gained, and the ups and downs (literally!) of the building process. 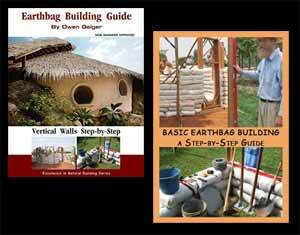 Several other earthbag homes are also shown. For more information about the house see this page. To view a streaming video introduction to this DVD click here. Dear Mr.Geiger: For the last months I’ve been researching all I can about earthbag building and I think I have sufficient information to start my two story house (10.5 x 6.5 mts. which are Fibonacci numbers). However, I need to know if I’d have to put colums at each corner as I’ve noticed in many instructives that colums are not really needed. I live en Venezuela where the earthbag movement is not so popular so I’d much appreciate your advise. Details like this need to be analyzed by a local engineer who knows the full picture of the design, spans, roof loads, soil conditions, wind loads, size and type of bond beam, wall height, etc. There are lots of ways of reinforcing earthbags such as pounding 1/2″ rebar down through the bags, adding posts next to the wall, etc. If engineers are out of your budget, talk to some good builders to get their advice. Yes it will work perfectly if you build correctly. Search our Natural Building Blog for the two articles called Passive Cooling Strategies. Choose ten or so techniques and your house will stay cool year round. This video helped inspire me to start building with bags. It’s very inspirational. Wow! that is really impressive and such a great idea. great job!